The Army Corps of Engineers reports that Sea Bright suffered major flooding to low lying structures from tidal rivers and back bays and that sea walls are not designed to protect back bay areas on barrier islands. What does the Christie administration do with that analysis? Gov. Christie announced construction of another sea wall, this time along a 1,000 foot stretch of highly vulnerable beach in Sea Bright, (see DEP press release). Historically, the existing sea wall routinely has suffered damage from coastal storms and it was severely damaged, overtopped, and breached by Superstorm Sandy. You can read the local boosterism that politically persuaded the Christie Administration to build the project here – notably absent from that local boosterism is any recognition of the reality of climate change or sea level rise vulnerabilities. That’s why it is boosterism and not planning. Real planning is based on science and data, not political theater and economic development interests. “What we’re doing here is something that’s planning for incidents like Sandy, although I suspect we’ll never see anything quite like that again,” the governor added. Due to climate change, there is an increasing probability of recurring storm events in the future. At a cost of $8.5 million of State funds, the project is a huge waste of taxpayer money. As another example of denial of climate change and an accommodation to local boosterism, politics, and economic development, it is an abdication of governing and rational public policy. We’ve quoted Rutgers scientists and flood management experts regarding why sea walls fail to prevent back bay flooding, a problem they call NJ Shore’s “achilles heel”. We’ve illustrated other states’ coastal management programs that discourage sea wall construction. Sea Bright is particularly vulnerable to back bay and river flooding, as the Google maps photo above reveals. I was unable to find an online document of the design of the proposed sea bright sea wall, but I can almost guarantee that the design basis is the 100 year storm and that it does NOT consider climate change and sea level rise. Accordingly, the project is under designed and surely will be over-topped by storm surge waves, damaged, or breached by future storms. Engineered structures are designed based upon an event, e.g. the 100 year or 500 year storm. But scientists have observed that historical storm frequency and intensity statistics are no longer valid as a result of climate change, which will increase the severity and the track (or wind and wave/surge patterns) of coastal storms and the storm surge elevations and locations. Climate change is also driving sea level rise, which has a significant impact of storm surge elevations and intensity. Hurricane Sandy was an extraordinary storm, particularly in the coastal areas extending from Cape May, NJ to Montauk Point, NY. Peak water levels indicate that Hurricane Sandy was at least greater than a 200 year event (1 in 200 annual exceedance probability), greatly exceeding project design levels. In many locations, heavily developed areas on the bayside of many projects (and non- project areas) were subject to back-bay flooding and wide-spread inundation damage. Projects in these areas were not authorized or formulated to comprehensively manage flood risks from the back-bay. These bayside areas remain vulnerable to future flooding and sea level rise. Delivery of more comprehensive protection to affected coastal areas requires a broader approach to the investigation and planning of flood and coastal storm damage reduction projects that includes consideration of potential flooding of back-bay reaches of barrier islands among other concerns. Provision of increased levels of flood risk reduction may increase the cost of projects, so evaluation of such projects will be based on economic benefits, as well as other factors such as reduced risk of mortality and capacity for a resilient recovery. More see walls do not make the NJ shore more resilient. They just create a false sense of security and lock taxpayers into a costly losing game of pumping sand on the beach and repairing storm damage. From day one, we strongly criticized the emergency response, the limited evacuation, and especially the false and misleading information provided by government officials to the media and the community about the health effects and risks of the chemicals involved. The National Transportation Safety Board (NTSB) issued their Final Report on the Paulsboro toxic train derailment (I strongly recommend that you read the full Report here). There is particularly important information buried in the chronology presented in Appendix B, which I will focus on today. As we previously outlined, the Report presents a devastating critique of multiple failures by Conrail as well as federal, state, and local regulators and first responders. However, the Report ignores or superficially presents some important issues, and the recommendations fall short on the needed strong statutory and regulatory reforms. The NTSB Report also vindicates our multiple criticisms – which went unreported by the media in real time – with one exception. We knew that emergency responders were providing incomplete and at times false information about the chemicals and health risks involved and had failed to evacuate the exposed community as required by federal guidelines. But, because some of this false information appeared to have come from incident Command, we (mistakenly) assumed that those mistakes were made by the CTEH, a consultant to the incident Commander (The US Coast Guard), or the US EPA. The NTSB suggests that that was not the case, that the early errors came mainly from local fire and police emergency responders, and the Department of Environmental Protection. We apologize to CTEH and EPA for our mistaken assumptions. So, I thought I’d focus on a few of the more egregious failings and issues, most of which are being misrepresented or ignored in press coverage – via excerpts of the NTSB Report. In some cases, media coverage is so bad, it is making heroes out of those that should be villains, pilloried, and held accountable. About 7:30 a.m., police radio transmissions suggested that the vapor cloud was “nontoxic.” The police then changed the evacuation orders from mandatory evacuation to shelter-in-place. The police department did not become aware that vinyl chloride had been released until 8:30 a.m., just before the first incident command briefing. The situation was further confused when, at 10:30 a.m., the NJDEP publically (sic) announced that the hazard had dissipated. Therefore, the community protective measures were based on incorrect information about the released material. Let’s be very clear about what went on here. 1) The local police made a huge mistake. On the basis of that mistake, they reversed an evacuation order and failed to evacuate the community. This error resulted in emergency responders and the public being exposed to high and unsafe levels of extremely toxic vinyl chloride gas that could lead to irreversible and permanent health effects, including cancer. 2) The DEP – unlike the local police, who are supposed to be experts – made a erroneous public announcement that had no scientific basis and contradicted their own experts and available data (more on that when I discuss the chronology from Appendix B). The NTSB analysis of State oversight of local efforts, State Hazard Planning, and State government’s emergency response delicately dances around the responsibilities and role of State government and existing State government programs and resources. They compound this weakness by ignoring the policy of the Christie administration with respect to regulatory oversight, enforcement, and delegation to local government. NJ has important and relevant State laws, programs, and resources to manage chemical safety and emergency response that are far broader and stringent than federal laws, including NJ’s Right to Know Act, Toxic Catastrophe Prevention Act, and Spill Compensation & Control Act. DEP cut its teeth and established nationally recognized expertise, credibility, and a leadership reputation in emergency response, risk communication, risk assessment, risk management, and chemical safety – from the Chemical Control fire to the Napp Technologies explosion. These State laws, programs, and resources are completely ignored in the NTSB Report. Worse, NTSB misleading portrays NJ’s “home rule” tradition as an inflexible function of State law instead of a voluntary choice of policy, a practice of State abdication that is exacerbated by Gov. Christie’s anti-regulatory, antigovernment, and hand off local delegation policy expressed by Executive Orders #2 (“regulatory relief”), #3 (“red tape”), and #4 (no State government imposed “unfunded local mandates”). NTSB was highly critical of the NJ State Office of Emergency Management, including their failure to oversee local emergency management plans, which is something we have written about several times, in the context of Sandy, Bakken crude oil shipments, and the Paulsboro derailment. These statistics indicate that many communities in the state still do not have NJSP-OEM-approved EOPs and that these communities are likely unprepared for emergencies that could occur in their jurisdictions, as was the Paulsboro community. This problem is amplified by New Jersey home rule laws that keep authority for managing an incident at the lowest local government level, thus discouraging regional and state authorities from intervening in an incident, even when faced with obvious response deficiencies. The NTSB fails to note that is Christie policy that “amplified” NJ’s “home rule” tradition. This NTSB finding on State oversight should drive changes to strengthen NJ State law to put OEM firmly in charge and to better define emergency preparedness, planning, and response requirements. EPA and DEP were on scene before 9 am and fully aware of hazardous conditions (see chronology in Appendix B). Yet they sat back and failed to over-ride serious local errors – other than to make things worse by DEP’s providing false information – as local officials made mistakes, misled the public and the press, and allowed emergency responders and the community to be needlessly exposed. I was sickened by reading these excerpts in the response chronology provided in Appendix B. They show that DEP knew about risks but cared more for their own staff than the community. According to the chronology, DEP first learned of the accident at 7:40 am – why did it take 40 minutes to notify DEP? Too bad the public and the press and local emergency responders didn’t have the info that DEP had. So much for the hero myth about running into the burning building. DEP “will not be responding until the area is secure”. The NTSB recommends that PHMSA require railroads transporting hazardous materials to develop, implement, and periodically evaluate a public education program similar to that required for pipeline operators under 49 CFR Parts 192.616 and 195.440 for the communities along railroad hazardous materials routes. Unlike stationary or fixed facilities, railroads transporting hazardous materials are not required to work with communities to develop emergency plans. A fixed facility with a threshold quantity of a material designated as an extremely hazardous substance, as defined under 40 CFR 355, has significant obligations to the LEPC for both emergency planning and release notification.43 The facility emergency planning responsibilities include providing emergency planning notification to the LEPC and SERC, providing an emergency coordinator who will participate in the local emergency planning process, providing notice of any changes occurring at the facility that may be relevant to emergency planning, and, most importantly, providing any information necessary to develop and implement the emergency plan. This information typically includes the type and quantity of the hazardous materials as well as other relevant data. Except as provided in section 11004 [Emergency Notification] of this title, this chapter does not apply to the transportation, including the storage incident to such transportation, of any substance or chemical subject to the requirements of this chapter, including the transportation and distribution of natural gas. Therefore, railroads are exempt from the EPCRA requirements to work with local emergency responders and the LEPCs or SERCs for emergency planning. The absence of any federal requirements for railroads to assist with local emergency planning leaves communities unprepared for hazardous materials releases. The issue is even more significant when the threshold quantities that trigger the EPCRA emergency planning regulations are examined. The threshold planning quantities for hazardous chemicals used at a fixed facility are often several orders of magnitude less than quantities that are routinely transported through these same communities, frequently to or from the regulated facility. For example, the fixed-facility threshold planning quantity for chlorine is 100 pounds. The train that derailed in Paulsboro was transporting four tank-car loads of chlorine (each with approximately 180,000 pounds of chlorine), more than 700,000 pounds. Although chlorine was not released in this accident, it could have been since it was in a tank car only 14 cars behind the last derailed tank car. NTSB largely confined their analysis to hazards from “train traffic”, thereby inexplicably ignoring larger risks from the massive chemical industrial complex in the region. Railroads, including Conrail, express frustration with local emergency responders for a lack of participation in railroad- or TRANSCAER-organized training events. Prior to the accident, TRANSCAER of New Jersey held several free tank car training sessions in and around GloucesterCounty. Training was held at Woodbury RailYard in GloucesterCounty on April 20–21, 2012, 7 months before the accident. This training was sponsored by the Dow Chemical Company, which teamed with Norfolk Southern Railroad, Conrail, the Firefighters Education and Training Foundation, the Chemical Transportation Emergency Center, and many other local supporting agencies to make this educational opportunity available to local responders. However, no members of the Paulsboro Fire Department attended that training. Someone needs to be held accountable for refusing free training. “The NTSB should be a shamed of themselves for ascribing their names to that report,” said Burzichelli, a Paulsboro native and the borough’s former mayor. It’s Burzichelli who should be ashamed – for selling out his own people and cowering to chemical corporations. There are risk management and community hazard planning reforms that can be implemented without legislative change in existing DEP regulatory programs (e.g. TCPA, RTK, EPCRA, Spill Act) – including those similar to the grave to grace approach to the off site transportation scheme required for shipments of hazardous wastes. OEM can beef up local and county requirements as well. Other reforms, like eliminating the liability cap on accidents require legislation. All of these were ignored by NTSB. More to follow on this set of issues. Hurricane Cristobal is moving up the Atlantic Coast, and experts are warning the public about dangerous rip tides, which killed a man in nearby Ocean City, Maryland. 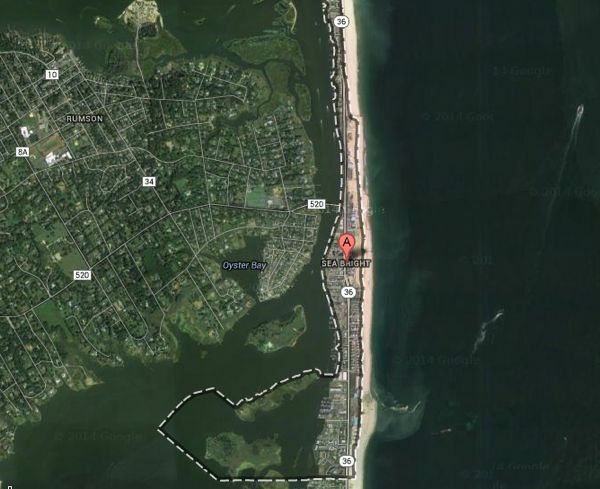 A teenaged swimmer is drown right here in NJ, at Sandy Hook. Tragically, it just so happens that the youth was swimming in an area not guarded by lifeguards. So, just hours later, fully aware of the situation and the risks to the NJ shore, what does the DEP press office do? As is the case throughout the summer, swimming in unguarded beaches at any location at Island Beach State Park is strictly prohibited. That is beyond oblivious and insensitive – its just flat out twisted. We understand that a press office’s role is to divert media from bad news and vulnerabilities. We realize that Gov. Christie’s Sandy stagecoach has turned back into a pumpkin, and that the press and the public now realize that NJ is highly vulnerable to hurricanes – and that Gov. Christie has done nothing to reduce those risks and vulnerabilities. We know that another hurricane brings back the trauma of Sandy. We know that DEP is being harshly criticized for proposing a major new coastal management rule that fails to address sea level rise and climate change, and actually promotes new development in hazardous locations. So, of course, the DEP press office is desperate to deflect media and public attention away from all this bad news. But, to do so at the expense of the loss of human life is truly warped. Yesterday, again fully aware of Hurricane Cristobal’s existence and ability to highlight unresolved risks and issues for the NJ shore, the Gov.’s press office issued this release obviously designed to change the subject of hurricane risks to the Shore, touting Sandy buyouts. Of course, the lapdog Star Ledger State House reporter uncritically transcribed it in this story. You’d think DEP would at least clean up the mess BEFORE they issue the self serving press release about the mess. Earlier today, the screaming headline of DEP’s press release immediately caught my eye: SIX MORE CHARGED IN DEP CRACKDOWN TO COMBAT ILLEGAL DUMPING ON STATE LANDS. For the first time I can recall, DEP actually bragged that one of the alleged violators (or are they evil doers?) had already been deported to Guatemala and another was facing jail time for failure to appear in court to answer the DEP summons (this was for a minor littering violation, not illegal disposal). Wow. Imagine that. 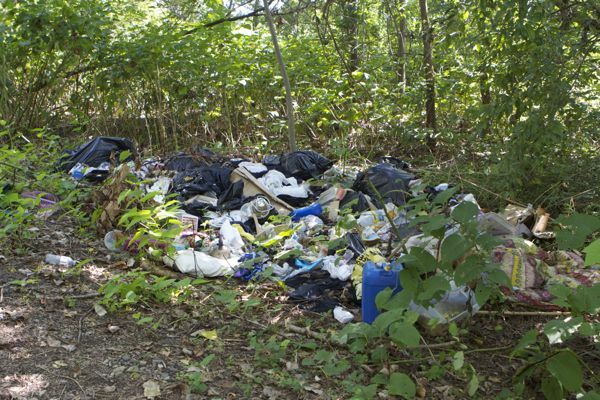 Jail time and deportation for littering in NJ state parks. That Christie DEP must have an enforcement hard-on, right? You mean the Christie Administration, who has surrendered the enforcement stick and has the worst enforcement record in the history of DEP – with enforcement fines, inspections, and violations down by as much as 90% – is actually enforcing environmental laws? The DEP that just indefinitely extended the enforcement shut down order for the BL England coal power plant? The administration that took no enforcement action for a toxic spill that hospitalized scores of people and forced evacuation of a town? The Administration that wants to rehabilitate the State’s unrepentant worst wetlands violator and ideological foe of environmental regulation and enforcement to sit on the Pinelands Commission? The DEP that paid convicted felons to haul Sandy debris and issued DEP permits to a convicted felon to create the Fenimore landfill fiasco? The DEP that itself illegally dumped waste on Bulls Island State Park – and then lied to the press and then even lied to the US Army Corps of Engineers about it – sees no hypocrisy in cracking down on illegal dumping on State Lands? You mean the DEP with this kind of enforcement record is OK with people being deported and serving jail time for merely littering? Wow – I gotta see that. Since I live just 5-6 miles south of the Duck Island portion of the D&R Canal State Park where some of these these major crimes occurred, I immediately hopped on my bike, camera in tow, to visit the scene of the crime and check it out. I quite reasonably figured if DEP were cracking down on illegal disposal in State Parks, perhaps they also might be interested in using that enforcement power to improve the conditions of the park for the people and wildlife that use it. What I saw might surprise you. Put simply, I was wrong. 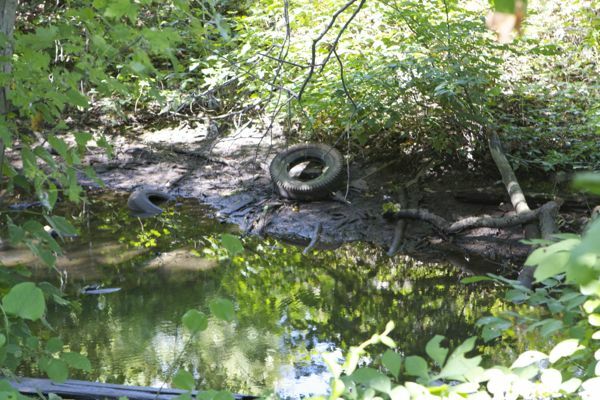 The segment of the D&R Canal Park from Trenton to Bordentown is neglected by DEP. It runs parallel to I-295, adjacent to the Trenton-Hamilton marsh, past the PSEG Duck Island power plant, the City of Trenton’s sewage treatment plant, oil depots, landfills, and toxic waste sites. The canal path also provides an easement for a major pipeline to fuel the PSEG plant. Portions of the canal are so sedimented and overgrown that the canal no longer flows. The water is stagnant and covered by bright green algae scum. I saw dozens of tires and a boat dumped in the Canal. A tree was down, totally blocking the path. These horrible conditions would never be tolerated in the Hunterdon and Somerset County portions of the D&R canal path. So, since DEP apparently lacks the resources and or will to remedy these conditions, PSEG should adopt the D&R Canal segment that runs past their Duck Island power plant, from Trenton to the Bordentown marina. That is a roughly 5 mile neglected portion of the D&R Canal Park. (additional photos in next post). PSEG should do that as a good corporate neighbor, but especially in light of the huge subsidies and multi-million dollar sweetheart deals they have enjoyed from DEP park land easements (take a look at PSEG easements in just D&R Canal State Park). PEER blew the whistle multiple times on financial audits of DEP that showed below market leases and easements across state lands for highly profitable industrial uses like oil and gas pipelines. (see this and this and this). But DEP has ignored that law, still has not renegotiated existing leases, and their policy on new leases also fails to recoup full market value. We will be petitioning PSEG and DEP to implement this kind of restoration program – more to follow on that. A few months ago, I sent the D&R Canal Park Superintendent a note about the need for maintenance, and within a few days, a DEP parks crew responded. So, after this post, I honestly expected that at least the garbage would be gone and maybe the downed tree blocking the path removed. Nope – all the mess still there. Trail users had managed to cut a path under the tree. I’ll reach out again to the Park Superintendent. I have many DEP readers, so guess Wolfenotes lacks the firepower these days – or maybe the DEP management, after I rubbed their noses in the Bulls Island mess, is spiteful and doesn’t want to give me another win – or else DEP is just shameless. 1) there is a fresh illegal garbage disposal site just south of the Lamberton Road trailhead. Can you send a crew out to clean that up? 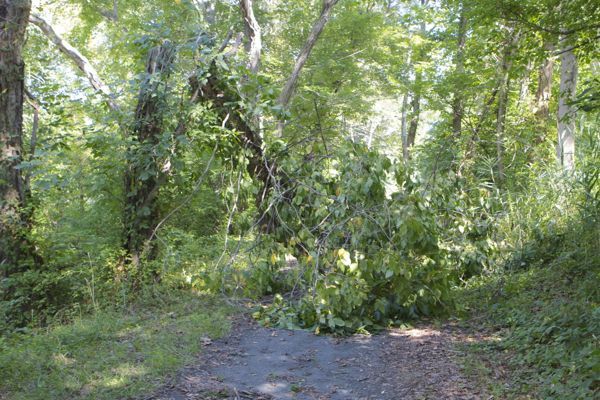 2) a couple of hundred feet south of the garbage, a tree is down blocking the trail. Can you send a crew out to remove? 3) as you know, the stretch of the canal along Duck Island badly needs dredging. Is that possible that DEP could do that? 4) as you know, there are scores of illegally disposed tires and other garbage, including a boat in the Canal. When can DEP send a crew out to remove all that? 5) Have leases and easements across the Park been renegotiated and updated to reflect current full market value as directed by 2008 legislation? 6) Would it be possible to get PSEG to partner voluntarily in maintaining and improving this stretch of the Canal? I am particularly interested in getting this work done, given DEP enforcement crackdown on illegal disposal on state lands and state parks. Hopefully, that initiative has freed up management attention and resources. Appreciate your timely and favorable consideration and response. My trip to California got me thinking about the epic drought there and the various mitigation strategies being considered, including the reuse of wastewater. Reuse of treated wastewater (e.g. the discharge from sewage treatment plants) is a controversial topic, even for relatively minor uses, like irrigation of golf courses or non-food crops. The concept of using treated sewage for public water supply is virtually an unspoken taboo. So, I thought readers would be interested in exploring the implications of the fact that NJ, for decades, has relied on a massive wastewater reuse project – for drinking water – in the Passaic Basin, including the Ramapo, Pompton, and Passaic Rivers. During dry periods and summer months, the flows of those river are dominated by wastewater discharges – at times over 90% of the rivers’ flow comes from wastewater treatment plants. The water supply infrastructure is designed to rely on wastewater discharge. And the Passaic Basin is not the only place where NJ residents are drinking million of gallons a day of treated sewage. Water supply intakes located on the Delaware and Raritan rivers, among others, also rely on significant flows of treated wastewater. Over the past few years, the Division of Water Quality Reclaimed Water for Beneficial Reuse Task Force has been working to promote and implement the beneficial reuse of wastewater from domestic and industrial wastewater dischargers. RWBR involves taking what was once considered waste, giving it specialized treatment, if necessary, and using it for public and/or restricted access uses. This high quality reclaimed water can be used for non-potable applications in place of potable water or as a supplement to potable water. RWBR has a myriad of application potentials including the spray irrigation of crops, parks, and golf courses; dust control; fire fighting; and toilet flushing, to list a few. The high-level of disinfection and effluent treatment required for RWBR protects public health and environmental quality. 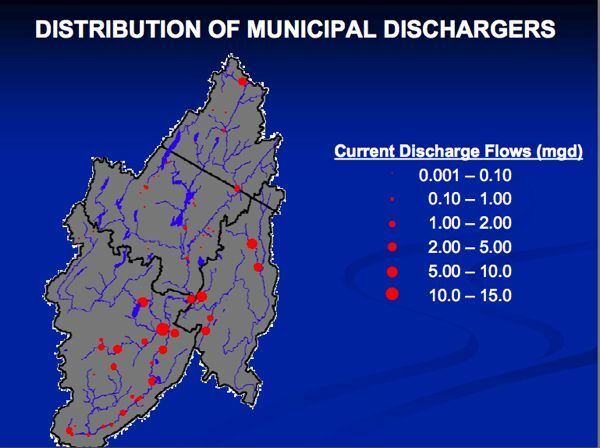 Does discharge and dilution of wastewater in a river alter the fact that the wastewater is “recycled” or “reclaimed” and “reused” at downriver water supply intakes? Even when wastewater is 50% or more of river flow? 90%? Perhaps if DEP released the long overdue Update of the NJ Waster Supply Master Plan, we could have a public discussion about these controversial practices. Bill Wolfe, New Jersey director of Public Employees for Environmental Responsibility (NJPEER), said the DEP’s proposed new approach fails to consider the ecological impacts of nitrogen on waterways. “It ignores longstanding historical policy of ‘source water protection’ — that the policy burden on the wastewater dischargers is to protect water supplies — and shifts quite a bit of the cost and compliance burden onto the water purveyors,’’ Wolfe said. In the Passaic River, there are 72 sewage plants discharging into the waterway, which supplies potable water to millions of customers in the region, according to Tittel. In the Raritan River, there are 60 such plants discharging into the river, also a major source of drinking water, he said. That discussion would also include whether we should upgrade drinking water treatment technology given the large amount of wastewater discharged to water supply rivers and the hundreds of unregulated chemicals detected in these rivers we rely on to provide drinking water supply. The discussion also might consider not only the serious adverse health effects of these largely unregulated chemicals on people, but on fish and wildlife, particularly in light of recent news reports of “intersex fish” in the Delaware River. But let’s get back to the topic of this post, which is the effective reuse of wastewater for drinking water. At the confluence of the Pompton and Passaic Rivers, the Wanaque South intake diverts water into the Wanaque Reservoir. Water diverted at this location can, depending on pumping relative to stream flows, include both the Pompton and Passaic Rivers. As a result, phosphorus loads from both waterbodies can be directed to the reservoir, where they accumulate and cycle within the impoundment creating the opportunity for excessive primary productivity over the growing season. High levels of chlorophyll-a have been observed in the Wanaque Reservoir, although measured levels are lower than they would be naturally due to physical and chemical control measures exercised by NJDWSC. But the pumping of polluted river water to the Wanaque Reservoir is not the only reuse of wastewater in the Passaic Basin. NJ residents are drinking almost 500 million gallons per day of treated wastewater. Should DEP be strengthening water quality standards and regulating more chemicals to protect your drinking water? Should DEP be requiring that wastewater plants upgrade their treatment technology to remove more chemical pollutants? Should DEP be requiring that drinking water plants install state of the art activated carbon treatment technology to remove unregulated chemicals? How much are you willing to pay for safe and clean drinking water? Gov. Christie’s DEP Commissioner wants to provide “regulatory relief” to those drinking water and sewage treatment plants – what do you think about that? Let the Gov. and your legislator know.